WTE159D is a Guy Arab V with Northern Counties H73F body (well, she did start her life with Lancashire United!) in service with Verwood Transport. The indicator display has been altered to suit a more rural operation, and we see her in the yard at Mallard Road during an open day at the Bournemouth Corporation transport depot on 22 May 1983. This beauty gives one a good idea of what a front entrance Middlesbrough Arab would have looked like Quite superb in my opinion! Thanks, Chris. When Wilts & Dorset took the firm over, they were so impressed that they painted a VR – S suffix so too new for these pages – in Verwood livery. Equally smart. U seem to remember that the proprietor of Verwood Transport trained as a driver at Middlesbrough and that’s why he chose the blue livery. So, Stephen, a variation on the theme of Managers taking the livery of their former command to their new one – there are several instances in these pages! In the early 1980s Verwood was a growing community somewhat neglected by public transport. Hence Andy Wood stepped in to provide services to Poole and Christchurch on different days. 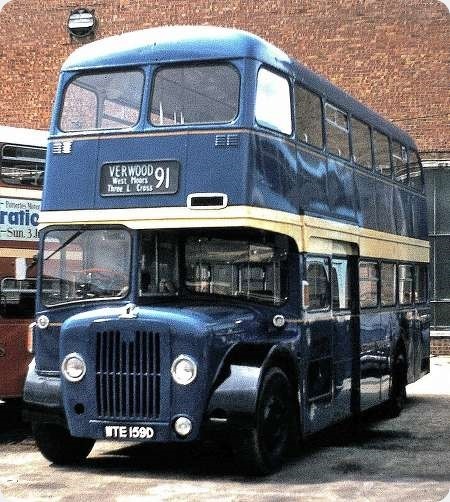 As Verwood Transport , he acquired a Leyland PD3 ex Brighton Corporation. This was soon replaced by the Guy Arab shown. Both vehicles and indeed subsequent rear engine vehicles were always worked OMO [as it was known in those days]. The Guy was unique in the area and was much appreciated by passengers and enthusiasts. These buses had deep, vertically slatted grilles either side of the destination boxes when they were with LUT. Were they fitted with Cave-Browne-Cave heating equipment when new or were the grilles for some other purpose? Either way, this beautifully presented vehicle has had them removed and replaced with very much smaller, natural air vents. Keith, I wasn’t aware of an ex-Brighton PD3, never having seen it, but I do have a view somewhere in our Editor’s ‘in tray’ of a former BEA Routemaster. Unfortunately, due to lack of space following our recent move to a flat, most slides are unavailable at present so I cannot attach an image of the PD3. 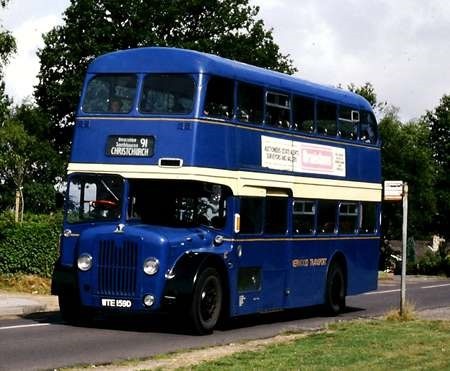 Likewise the Routemaster which was RMA11. This subsequently passed to an operator in Leighton Buzzard who used it in full Verwood Transport livery. After de-regulation, Andy together with Roger Brown [Shaftesbury & District] re-introduced services in the area and I have attached an image of RMA37 in the green livery seen in Christchurch. 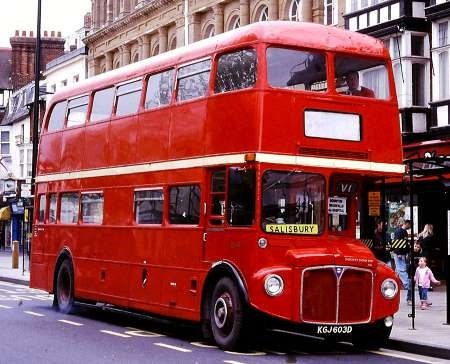 Finally is an image of the rebuilt and extended Routemaster RME1 which remained in red and is seen in Salisbury. What superb liveries are the blue and green examples shown here. I’m having to pinch myself here to make sure that its not April 1st . 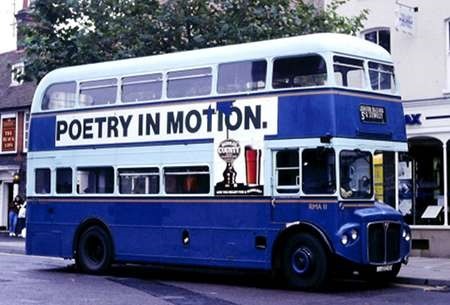 Joking apart, I have never heard of the RME extended Routemaster – have you any more details please. Even allowing for the Routemaster’s legendary front and rear modules this must have been quite an engineering feat, requiring longer prop shaft and pipelines of varying sorts. Chris the last time I saw RME 1 it was on a wedding special in Halifax for a Keighley operator. Many thanks indeed Roger – I can’t understand how I’d never heard of this ambitious project, and very neatly and professionally executed I must say. I have to be quite honest, when I saw the picture I did think that it was a "spoof"
The centre staircase on RME1 is a one-piece grp unit from an Alexander bodied Ailsa. I knew of the extended Routemaster Chris (Y), and think it is a fascinating vehicle, but assumed that the conversion would have been carried out by London Transport rather than Shaftesbury & District. It just goes to show that we should never underestimate the ingenuity of the independent operator. Looking at Keith’s photos of the blue and the green Routemasters made me drift off into two of those ‘what might have been’ moments. The blue RMA gives a hint of what Samuel Ledgard’s later purchases may have included, following on from its successful ex-LT RTs and RTLs. 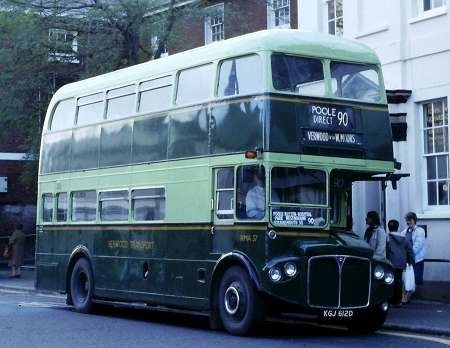 The green RMA’s livery is somewhat reminiscent of Leeds City Transport’s (although the upper deck window surrounds and roof would have been in the darker green of course), and could have been one of a batch bought new for use on the Leeds-Bradford 72 joint service with Bradford City Transport. Just idle thoughts I know but……. I notice in the photo at Roger’s second link, dated 2010, that the vehicle has acquired a twin headlamp front.The even window-widths make for a much neater style than the later halfwindow-width extended RM’s. Just an update for Chris. RME1 was on a two RM wedding special passing through Shipley this afternoon for Red Bus Days of Keighley.